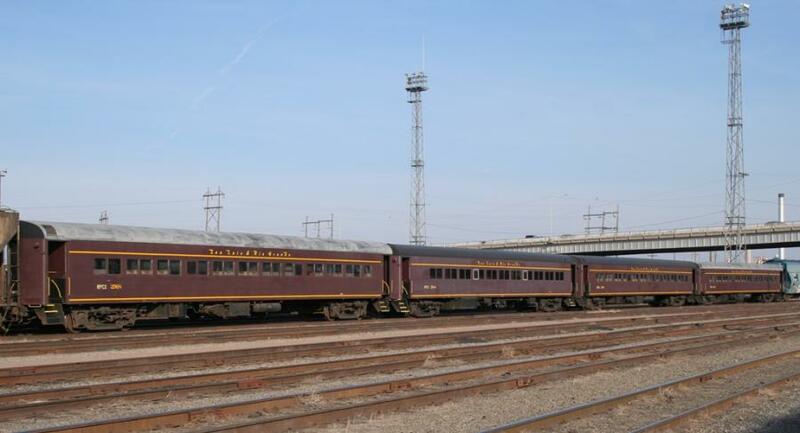 Four ex-Long Island passenger cars have arrived in Pueblo to be delivered to the San Luis & Rio Grande. The cars, RPCX 2948, 2968, 2970, and 2974, are in dark maroon paint with yellow SLRG lettering, done in a flying Rio Grande style font. Nathan Zachman managed to catch them in Pueblo on Saturday - you can see the four of them [here]. They're supposed to move south on Monday night's Pueblo-Walsenburg run. Silver Vista was an odd experiment by the Rio Grande. It was a narrow gauge observation car - not a true enclosed dome, but an open gon with a glass roof. The original was built by the Grande in 1947 from work car 0313 (which, in turn, was originally coach 313 until the mid-1920s). The Denver Public Library has a Robert Richardson photo available of the original car [here]. It lasted only a short six years before it was destroyed in a fire at the Alamosa car shop on 30-Sep-1953. Another DPL collection photo, this one by Otto Perry, shows the Vista after the fire is online [here]. Last year, the Durango & Silverton announced that they would be building a modern recreation of the car. On Friday, 17-Mar-2006, the new body of the car was moved from Melcher Bros, Inc., of Durango, who built the new frame, to the Durango & Silverton facilities in order to put it on rails and complete the car. Philip Walters was on hand to photograph the frame during its move. He's given me permission to repost his photos [here]. Also, Sunday's Durango Herald has a story on the car. It can be read in their online edition [here]. The car is supposed to be in service by 6-May-2006. For more information, or to make a reservation, see the D&S's website on the car [here]. In what has been a very rough season for the Ski Train, it sounds like it has suffered yet another pitfall. Kevin Morgan reports on Trainorders.com that a slide fence east of Crescent was triggered this evening, stranding the Ski Train between the east and west switches. Apparently the slide is not a false alarm, and it's going to take a while to clear it. The crew, having been on duty since 0700, has now gone dead on hours, and when you add to that the nearly foot of snow projected for the foothills, and it's going to be a difficult night. Update (19-Mar-2006 2125h): SKTX 242 just got a warrant, joint with some maintenance guys, to pass from Crescent down to Plain. Apparently I didn't hear the entire conversation, as Kevin reports via Trainorders that 242 has been cut loose to go down and assist with whatever the problem is (possibly a derailed hyrail truck). Update (19-Mar-2006 2204h): Sounds like the derailed hyrail is back on track and headed down the hill. I assume that means the obstruction is cleared as well, and things will be moving soon. NEW SLRG POWER COMING - F40M-2Fs! The rumor last month was that the SLRG would be receiving new power to replace the lease fleet they inherited from the old RailAmerica SLRG. Well, the new power is coming, and turns out it's at least three ex-Canadian American modified F40PHs. Units 453, 456, and 459 were spotted at North Platte, NE, and reported on RailroadForums.com in this thread. Sometimes I see things and start to think I'm imagining stuff, but no, turns out it's real. These are some seriously strange looking units once their noses were chopped to allow for freight switching service. Two wooden narrow gauge freight cars were destroyed, and a locomotive and another car were damaged due to a structure fire in Ogden, UT, last night. A bit before 2200h, the Shupe-Williams Candy Co. building, only a lot away from Odgen Union Station, caught fire. Responding fire crews determined that it was too dangerous to enter, and consequently let the abandoned building burn. While Union Station escaped without damage, the Utah State Railroad Museum had a few items stored an in adjacent lot that wasn't as well protected. Everything I've seen so far says that D&RG narrow gauge caboose 0573 (the first of the 0573-0579 "short" cabooses) and boxcar 3576 have been burned to the ground. High-side gon 1051 had one end burned. D&RG 223, one of three surviving D&RG Class 60 / D&RGW Class C-16 2-8-0s, and the only surviving member of the class built by the Grant Locomotive works, was also in the lot and exposed to the fire. It is currently being restored the Golden Spike Chapter of the R&LHS. The word right now is that it's scorched, but not a complete loss as many of the flammable parts (such as the wooden cab) had been removed for restoration and were not around the unit when the fire happened. No word on the cause of the fire yet, but since it started on the second floor of an unused building, you'd have to rule this one suspicious. The Ogden Standard-Examiner has a story on the fire on their website that you can read here. Joe M. just notified the DRGW list that a westbound UP passenger train (probably the same officers special that came over the KP this morning) went west through Arvada at 1620h. No word on destination or schedule. Update (8-Mar 0938h MST): They apparently overnighted in Glenwood Springs, CO, last night. Reported via the D&RGW list is that they were still in the station at 0630h this morning. Also, Kevin Morgan caught them working up the east side of the Moffat last night - see his photos here. Power is UP 3791, a flared/flagged SD70M. Update #2 (8-Mar 1028h MST): An update from Kevin M. via the list: The special is between Ruby and Green River right now, crew at Helper on duty at 1030h. His guess is that they'll be out of Helper between 1130h and 1200h.